This is the charging tab. When the phone is plugged in to the charger all the data will be live (if you just plugged it in please wait a few moments for the data to become more accurate). 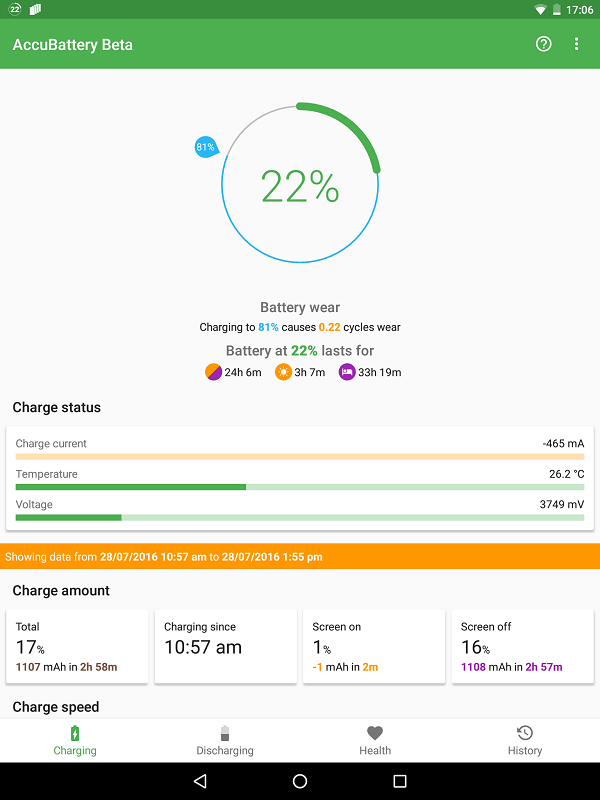 When you are not charging, the battery level and charge status will be live (hence the negative charge current and decreasing voltage in the screenshot below), while the rest of the page (everything below the orange banner) will show the historical data for the most recent charge. The current battery level is indicated in green, while the blue slider is the charge alarm. The alarm will go off when the chosen charge level has been reached to remind the user to unplug the charger. We recommend that users set this to around 80% to maximize your battery's lifetime. As you drag the blue slider to a charge level you'll see how much wear your battery will go through if you charge from the current battery level to the chosen level. You'll notice that especially above 90%, each additional percentage comes with greater and greater wear, giving you a diminishing return. Underneath the battery wear section you'll find our estimates for time remaining on current charge. It's split into time remaining based on mixed use (first icon), time remaining if you keep the screen on (second icon), and time remaining if you keep the screen off (third icon). All estimates are based on your usage patterns over the last 7 days. The mix ratio is estimated from your regular screen on/off ratio. 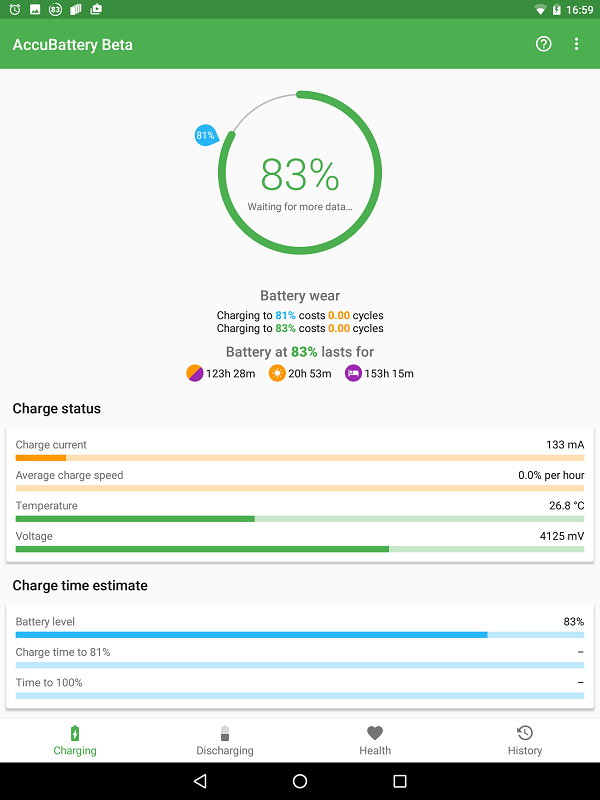 The charge status is split into 3 lines. Charge current is the live battery drain; when charging it's a positive number and when discharging it's a negative number. Temperature is the temperature of your battery. Voltage is the voltage level, for phone batteries 3700mV usually coincides with 0% battery left. The voltage at 100% battery level will differ per battery and usually vary between 4200mV and 4300mV though some manufacturers also set this to higher levels. The charge amount section deals with total amounts. It shows you the total % charged in the charge session as well as its equivalent in mAh and how long it took to achieve this. The second box shows the start time of the charging session, while the third and fourth split this data into screen on and screen off. Charge speed gives you the % change and mA change per hour during the charge session. The second and third boxes again split this into screen on and screen off categories. As mentioned in the hint card, if you wish to test your chargers or cables you should charge your phone with the screen off for a few minutes and then check the box for screen off charge speed to get an accurate reading. This is also the reason why the live charge current in the first section is not as useful for testing cables and chargers as your phone is using varying amounts of power when the screen is on. The battery capacity estimate shows you how we take an estimated capacity during each charge. Each charge translates to one of the green and gray dots in the third chart of the health tab. 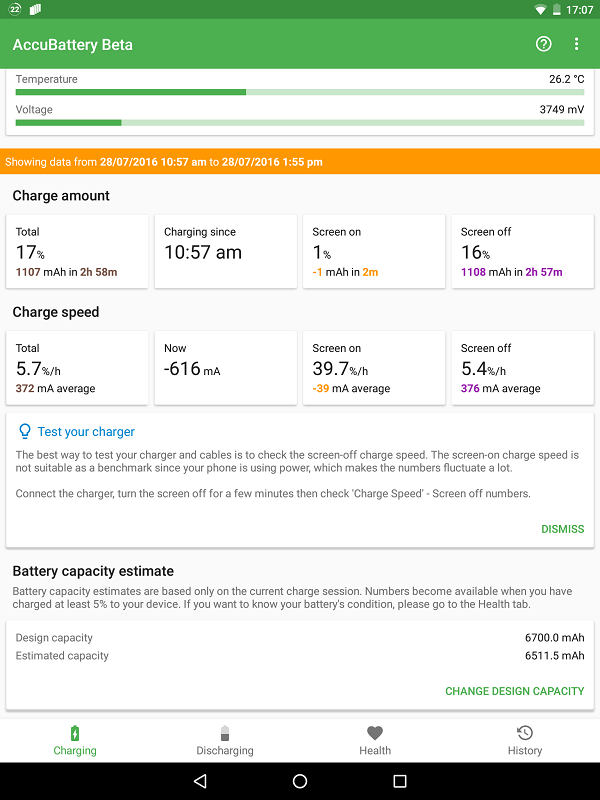 As we gather more data we're able to get a more accurate estimate of your battery's actual battery capacity and can then present the data in the health tab. When the phone is connected to the charger the entire charging tab becomes live. You'll then also get a time remaining estimate to let you know how long you'll need to continue charging to reach your alarm target or to reach 100% battery level.